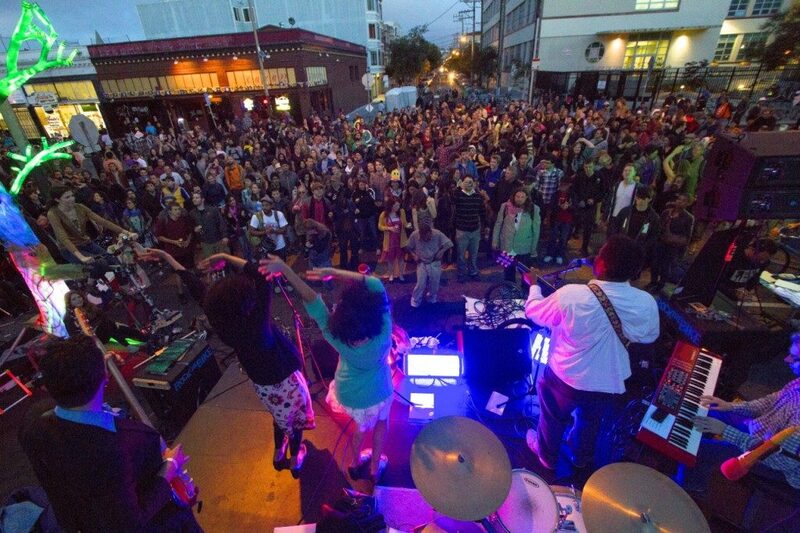 We are proud to announce, in partnership with the Life Is Living festival, our peers from West Oakland, the world’s largest Human Powered music festival is coming to Oakland this October 11. After seven Junes of solstice celebration in San Francisco, with venues ranging from Alemany Farm to Pier 7, from Dolores Park to Golden Park and the street closure of 22nd & Bartlett pictured above, we have decided to challenge ourselves with an entirely new geography: Oakland. Our day venue will be Defremey Park (a.k.a. Lil’ Bobbie Hutton Park), the historically significant epicenter of the Black Panther Party. 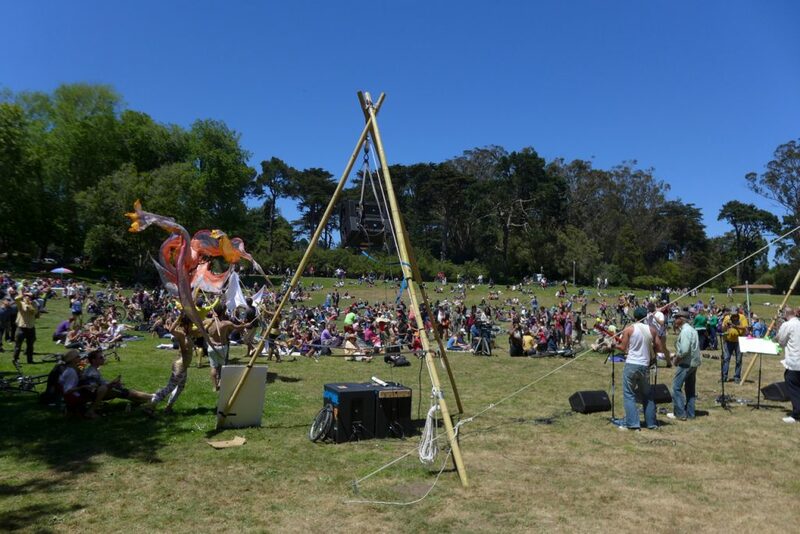 This park is finally getting the attention it deserves from the Oakland Parks Department, thanks to our partner the Life Is Living festival, who have championed the park and rallied the local community at their events since 2007, the same year BMF got off the ground. Our Night Venue , and LiveOnBike route, TBA! Volunteer opportunities! We have them. Want to be part of this year’s fest? We’re holding monthly BMF volunteer meetings on the 2nd Wednesday of the month. To get an invite, get your name on our handy volunteer form or simply lurk on the BMF Facebook Page. We’re thrilled to be partnering with Life Is Living festival whose values are so much in line with ours — non corporate sponsored, emphasizing the arts, sustainability, and social justice, a festival that has also drawn big name acts including Mos Def, Dead Prez, and Talib Kwali in recent years. We look forward to keeping you posted on our lineup, our LiveOnBike mobile concert, our night venue, as well as our participatory non-musical acts, food, and happenings. If you’re checking our site, you’re one of the cool ones who are thinking ahead to this year’s BMF. We thank you for spreading the word and giving us the freedom to try new things. Onward to Oakland. October 11, 2014. Mark your calendar!